Córdoba, on Andalucía's great river Guadalquivir, was a Roman provincial capital 2,000 years ago, but its golden age came with the Moors. In the 10th Century it was the western capital of the Islamic empire, today it is an atmospheric city, its ancient quarters and great buildings reflecting a long and glorious city. The heart of Córdoba is the old Jewish quarter near the Mezquita, known as the Judería. A walk through this area and its narrow, cobbled streets makes you feel as if you have taken a step back in time and most of the sights are in this area, whilst modern city life takes place some blocks north. Córdoba's historic centre has been declared a World Heritage Site by UNESCO, one of no fewer than 11 Spanish towns which have been awarded this denomination, making Spain the country with the largest number of World Heritage towns in the world. The highlight of a visit to Córdoba has to be its Great Mosque, known as La Mezquita. The original mosque was built between 785 and 787 but the building has evolved over the centuries, blending many architectural forms. The most contrasting of these is the 16th century Cathedral which was built in the centre of the mosque after the re-conquest, destroying some of the original mosque. However, rather than seeming an intrusion, the incongruous juxtaposition of two so very different styles and religions is a unique spectacle and one which serves only to increase the attraction of La Mezquita. Among the many other sights worth visiting in Córdoba are the Alcázar del los Reyes Cristianos, a palace-fortress built in 1328 and boasting beautiful gardens; the Mudéjar-style synagogue, one of three in Spain preserved from that era; the Roman bridge which has Roman foundations but was rebuilt by the Moors and, at the end of the bridge, the Torre de la Calahorra, a tower built for defence in the 14th century, and now housing a small museum. Whilst strolling through the streets of Córdoba, look out for the beautiful patios in the houses of the old quarter. Since early times, family and social life in Andalucía have revolved around the courtyard, or patio, which is at the heart of the classic Mediterranean house. Brick arches, colourful tiles, ironwork, orange and lemon trees and pots full of flowers add to the charm of these cool and tranquil retreats. There are traditional patios in the San Lorenzo and Judería quarters and in the Barrio San Basilio, west of the Mezquita. Nature lovers and fans of environmentally friendly sports will find protected areas of great value, such as the nature reserves of Sierra de Cardeña and Montoro, Sierra de Hornachuelos and Sierras Subbéticas. These spots offer many hiking routes and the chance to go climbing, potholing, mountain biking and paragliding. The Guadalquivir River and its tributaries and dams, provide the ideal setting for angling. In addition, golf enthusiasts will be able to enjoy their favourite sport in the excellent facilities provided by the Cordoba Country Club and Pozoblanco Golf Club provide, each with 18 holes. If you wish to stay in a hotel away from the city centre and so be within easy reach of both the countryside and the golf course as well as the city, then why not try Córdoba's Parador, La Arruzafa, which is built on the ruins of the summer palace of Aberderramán I, at the foot of the Córdoba mountain range. 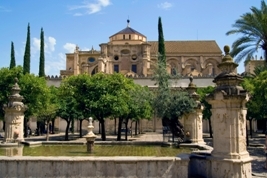 Córdoba has good road connections to the other Andalusian capitals, and it also is served by the high speed train (AVE) and a very extensive railway network linking it to all the big cities, like Madrid and Seville.